In recent weeks the team at Capital Restoration Cleaning have provided assistance to many Melbournian’s affected by the sudden burst of strong rain and wind. The storms have caused extensive damage and we would like to thank our team of certified Water Damage Restoration Technicians and their assistants for their great work in helping Melbournian’s dry and restore their wet carpets and water damaged floors after the sudden freak floods and water leaks. 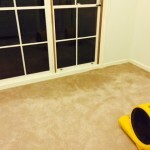 This entry was posted in Carpet Drying. Bookmark the permalink.